LILONGWE-(MaraviPost)-Malawi’s constitution provides for a presidential system whereby the president is both head of state and head of government, and of a multi-party system. The President chooses his running mate who becomes the Vice President of the country after the election. The President is chosen through universal direct suffrage every five years. But the President has the option of appointing a second vice president, who must be from a different party. Since attainment of Malawi’s democracy, the office of the vice president has been not effective because the Vice President does not understand his deputising role. The Vice President thinks he is an automatic successor of the President’s position. Yet, Malawi is a democracy and intra-party democracy demands that there is no automatic succession to any position. It would be an act dictatorship for a sitting president to handpick his next successor. Besides, the Vice President had to be scrutinized and pass the litmus test if he is a capable leader who is trusted both by his party and Malawians at large. Chilima is not trusted yet. However, the office of the Vice President remains powerful per constitution requirement that need the one occupying the seat be a person of integrity and statesmanship of helping the serving head of state not always spoon-feeding. Basically, Chilima is abusing his office. In a country where citizens care about defending their constitution, Chilima could be charged with abuse of office. Chilima is using his position to exploit government resources (which he is not working for) to fight the same government that put him in the position. That is why he wants more powers. Does what the current Vice President Saulos Chilima political rhetoric making sense that his United Transformation Movement (UTM) will facilitate the amendment of the Republican Constitution to give the office of the vice president more authority and certainty and not be dependent of the Head of State. “I do not want my deputy to go through what I have gone through and others before me have gone through,” said Chilima at a political rally on Sunday at Ntcheu Secondary School ground which is near his Nsipe home village. Chilima who punctuated the speech with his trademark proverbs, said there was need to empower and respect the office of the vice president. He said currently the office has been rendered useless and is ceremonial since the duties are delegated by the President. 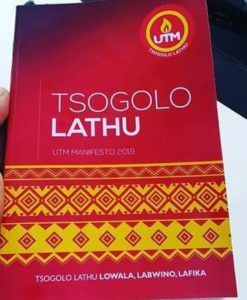 No wonder, a legal expert Justin Dzonzi has faulted Chilima for suggesting that UTM will facilitate the amendment of the Constitution to give the office of the vice president more authority and certainty. Justin Dzonzi observed that doing so would be creating another parallel government within the government. Dzonzi further said that world over, the office of the vice president falls under the office of the president, saying this is because the vice president is just a care taker in the event that the office of the president falls vacant. “It would be wrong to give the office the permanent mandate; the vice president elsewhere gets instructions from the president. The framers of the Constitution knew what they were doing,” queried legal expert Dzonzi. On security details for the office of Malawi’s president, Chilima using the same Ntcheu rally promised the nation to cut the presidential convoy on the first day of his job if elected President in May 21 2019 Tripartte Elections and stop the culture of lining up the police along the roads, saying this was slavery. He said the tendency of lining up the law enforcers from Blantyre to Lilongwe just because one person (the president) wants to use the road was dehumanizing and glorification of a mortal as an immortal. But the same Chilima is currently using heavy security to his political rallies. Even when Malawi Government tried to trim his security details he rushed to the court claiming the same services. Just years ago, when US Secretary of State Hillary Clinton visited Malawi, there was no walk out in the city centre of the capital Lilongwe. This signifies the important how security is important to citizen number one of the country as any comprised head of state security, the nation is at stake. If indeed what Chilima is saying on security details remains practical, let him show it to the nation now otherwise is another pathological hypocrisy that needs to be watched out. The UTM leader must be grateful to the leadership of this country that he still enjoys all entitlement despite not currently working as the Vice president of this country. Being the second in command, Chilima must have initiated these reforms while he was serving the nation not now after when he did not get favours from the Democratic Progressive Party (DPP)’s leadership ahead of 2019 general elections. Since Chilima came to limelight, he has been giving promises such as creation of 1 Million jobs which analysts said that cannot happen in Malawi. Political and social commentators have warned United Transformation Movement President Saulos Klaus Chilima against giving Malawians more promises. Social Commentator Humphreys Mvula says giving promises is one thing and implementation is another thing. “The ideas Chilima telling the nation look too good to be good, but it looks he (Chilima) is just over ambitious. “As a country lets avoid the culture of electioneering because we can give promises which we cannot fulfil as leaders,” said Mvula. President Peter Mutharika gave Chilima a chance by taking him under his roof but later betrayed the president. If indeed everything in the current leadership is corrupted, then why could he wait so long to come out to the public? Surprisingly, Chilima is still getting money from the same corrupt leadership, this is hypocrisy at its best which the nation must watch a head of 2019 general elections. The UTM leader once betrayed his wife, now the President Mutharika, next will be the nation at large which needs to be checked sarcastically before mischief is advancing. There is un decisiveness and double faced in Chilima. This can be attested by what he once said earlier of his term. “The number of principal secretaries will be reduced from the current 96 to 40 as part of public service reforms. I will upgrade DCs to be at level of PSs,”Chilima once said in December 2014. The UTM leader once betrayed the President Mutharika, next will be the nation at large which needs to be checked out sarcastically before his mischief is advancing a ahead o 2019 elections. Upgrading DCs to be at level of PSs does not make sense. Between PS for Local Government and DC, who will be the boss? This boy is kidding us as if we are his fellow babies.